DETROIT (AP) — The Toronto Blue Jays are going to enjoy Monday’s day off after all. Justin Smoak had three hits, including a homer, and drove in three runs to help the Blue Jays end a five-game losing streak with an 8-4 victory over the Detroit Tigers on Sunday. Aaron Sanchez (3-5) pitched six innings and ended a five-start winless streak, giving up one run on two hits and three walks while striking out seven. Michael Fulmer (2-5) allowed four runs on five hits and three walks in six-plus innings, striking out three. Fulmer has a 6.89 ERA in his past six starts. Sanchez and Fulmer kept the game scoreless through five innings. Fulmer walked Yangervis Solante with two outs in the sixth, and Smoak hit a 3-2 fastball over the scoreboard in right-centerfield to give the Blue Jays a 2-0 lead. Leonys Martin led off the bottom of the inning with his seventh homer to make it 2-1. Fulmer gave up a single and a walk to start the seventh, and was replaced by Warwick Saupold. Devon Travis hit the ball to the wall in right, but Nicholas Castellanos made a leaping catch at the wall. Kevin Pillar took third on the play and scored on Randal Grichuk’s double, giving the Blue Jays a two-run lead. Aledmys Diaz put Toronto ahead by three runs with an RBI single, and Solarte made it 5-1 with a two-out hit. The Blue Jays got a bad break when Smoak’s 414-foot double bounced off the centerfield fence – Solarte would have scored easily from first – but Diaz’s run gave Toronto a 6-1 lead. Grichuk hit a two-run homer off Zac Reininger in the eighth to make it 8-1. The Tigers scored three runs off three Toronto pitchers in the bottom of the inning, but Ryan Tepara retired five straight batters to end the game. Jose Iglesias doubled in the seventh to extend Detroit’s streak to 50 games with at least one two-base hit, the fourth-longest streak since 1908. The Tigers could pass the 1999 Atlanta Braves for third with doubles in both halves of Monday’s doubleheader. Blue Jays: OF Teoscar Hernandez (foot) did not play. He left Saturday’s game after fouling a ball off his left foot, but is expected to return early next week. Tigers: C James McCann left the game after six innings with what the team described as a left-sided intercostal spasm. He hopes to play Monday. Tigers 3B Jeimer Candelario walked in the fourth inning to extend his on-base streak to 28 games. That ties him for the 10th-longest streak by a Tiger since 2001. Miguel Cabrera has the longest, with 45, while Hall of Famer George Kell has the longest since 1908 at 57 games. The Tigers lost for the first time since a Canada goose crashed into a third-deck scoreboard while trying to escape the stadium on Wednesday. The team has kept a goose decoy in the dugout during the ensuing four-game winning streak, which ended thanks to Smoak – a native of Goose Creek, SC. The Tigers optioned reliever Johnny Barbato to Triple-A Toledo after the game, and recalled starters Drew VerHagen and Sandy Baez from the Mud Hens. VerHagen will start the first game of Monday’s day-night doubleheader, while Baez will fill the 26th roster spot. Both teams are preparing to play the New York Yankees. 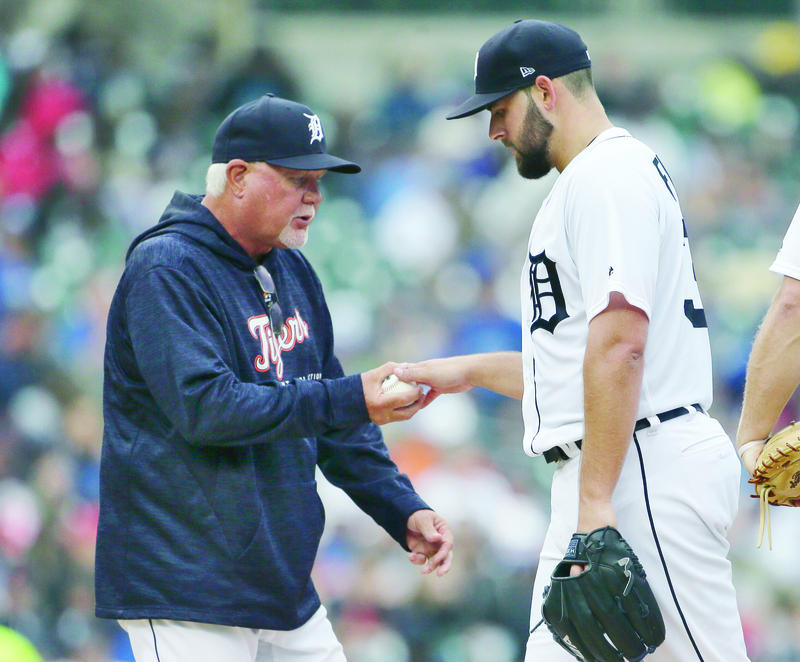 The Tigers host New York in a doubleheader on Monday to make up two April rainouts, and the Yankees then head to Canada for a two-game series with the Blue Jays beginning on Tuesday. Luis Severino (8-1, 2.31) is scheduled to pitch Monday’s opener against VerHagen (0-1, 6.30) while Mike Fiers (4-3, 4.45) will pitch the nightcap against a Yankees pitcher to be determined.